The days when smartphones and tablets played second fiddle to more muscular consoles and PCs are gone. Responsive, high-resolution touch screens and powerful phones let Android devices deliver full-featured action experiences complete with stunning graphics and gameplay to mobile gamers. But how to choose the right action game that will satisfy your taste for action games? We looked and found and amazing action game for your android device. Let’s see what this game offers. What kind of game is Great Wall of ChaCha: Jumping & Running? Great Wall of ChaCha: Jumping & Running is highly addictive action game for all Android users. Entertaining and easy to play it is the perfect choice for all ages that are interested in playing action games on their smartphones. Jumping, running and sliding through challenging missions and achieving the highest scores. The users get quality graphics, sounds, animations and designs, fun environment that makes the users addicted to it fast. This endless run android game is certainly the right choice for every action game lover out there. Simply created for all ages, offering many different features and challenging missions that must be completed! Users get to complete 3 different missions with running and jumping. The task for the users is to help ChaCha run and jump through many obstacles, avoid guards and save his family for the dangerous drug cartel. Using the boomerang, the users can also take the guards down. On the way, users must collect as much coins as they can to unlock many power-ups for higher scores. With the zip lines and power gloves the users can get through the missions faster and with highest scores. Also, the users get to collect many extra lives. 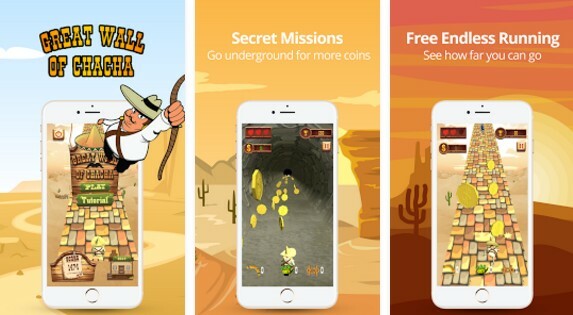 Download Great Wall of ChaCha: Jumping & Running for free from the following link, challenge yourself and enjoy!